Please note that you may click on the letter to enlarge it (very nice for older eyes). My apologies for not replying sooner. I loved your letter, especially that it came with a Self-Addressed, Stamped Envelope (SASE). That was very considerate of you. 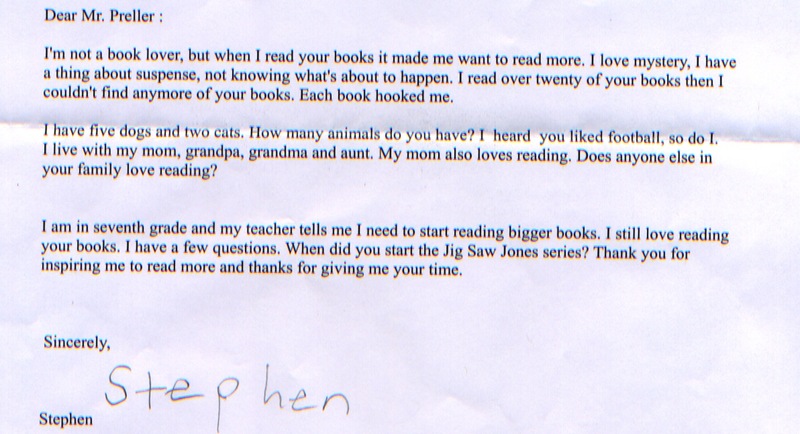 For someone who claims not to be a “book lover,” you’ve done pretty well if you’ve read more than twenty of my Jigsaw Jones books. I haven’t even read that many — and I wrote them! I think that as long as you stay open-minded about books, and willing to try new things, I’m sure you’ll continue to find something that you’ll like. There are so many great books out there for every kind of reader. At the same time, I think you should read the things you enjoy. I have three children and they are all readers. When school gets hectic, they don’t read for pleasure as much, which is too bad if you ask me. I hate to see when too much homework gets in the way of reading for fun. Pets-wise, we’re a two-cat & one-dog household. The cats are black and the dog barks at the passing breeze, the sound of footsteps a half-mile away, and the slow turning of the globe. It can get on my nerves sometimes. How do you teach a dog to stop barking? You’ve heard of the Dog Whisperer? I’m the Dog Screamer! (“DAISY! PLEASE!! I’M BEGGING YOU — STOP BARKING!! !”) Nope, doesn’t work. I think you’re very fortunate to live with your grandparents and aunt. My grandparents died long ago, and I still think of them, still wish I talked to them more, asked questions, listened to their stories, tried to understand what a different world they lived in — before computers and cell phones and so many other seeming essentials. Though I’m much more of a baseball guy. My middle son, Gavin (age 11) became a huge fan the past couple of years and his enthusiasm has brought me back to the game. Gavin even signed up for an ESPN Fantasy League — and won! We rooted together for the Jets and they almost made it to the Super Bowl. Almost, almost. what do you like to do when you are not writing a book? what is your nexts goal? how many books have you read in your life? what music do you like ? in the book bystander what is logo ?